Dragon Quest X is a Wii U role playing game developed and published by Square Enix. The game will be released both on the old Wii console and on the Wii U sometime in 2013. 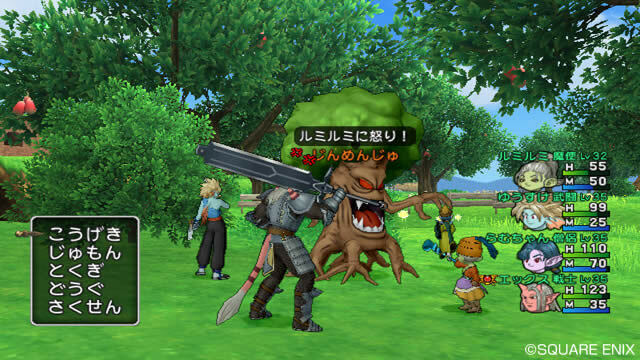 The Dragon Quest X Wii U version will feature improved visuals and full GamePad integration. The game is a classic RPG with some MMO elements, and will offer full online multiplayer on the Wii U. The game has already been released on the Wii in Japan, and has been met with great reviews so far. Dragon Quest X on the Wii U is a semi MMORPG, with the gameplay being more traditional with online RPG elements included. The player has access to a large open-world environment where they can interact with other players, NPCs, complete quests, and more Players will be able to team up with up to 4 others online. The game is set in the fictional world of Astoltia, which is split up into five continents. In Dragon Quest X, players start as a human, but after a while, the character morphs into one of five other races: Elf, Ogre, Dwarf, Puklipo, and Weddie. Each race has its own starting town in the game, with additional characters, shops, and so on. The game has a unique, cell-shaded visual style, much like Zelda: The Wind Waker.